MELVILLE, N.Y., February 5, 2014 – Canon U.S.A., Inc., a leader in digital imaging solutions, today announced its parent company, Canon Inc., has reached a new camera-manufacturing milestone as combined production of the company’s film and digital EOS-series interchangeable-lens cameras surpassed the 70-million mark on February 5th. Production of Canon EOS SLR cameras began in 1987 with the EOS 650 35mm SLR Camera, at Canon Inc.’s Fukushima Plant (now Fukushima Canon Inc.), and later moving to such production bases as Oita Canon Inc. and Canon Inc., Taiwan. Following the introduction of digital SLR cameras in the early 2000s, production of the EOS-series cameras rapidly increased, surpassing the 60-million-unit mark in October 2012 and now, approximately one year and four months later, reaching the 70-million-unit threshold. EOS, which stands for “Electro Optical System,” also carries the name of the Greek goddess of the dawn. Introduced in March 1987 as a new generation of AF SLR cameras, EOS cameras were the world’s first to incorporate an electronic mount system enabling complete electronic control not only between the lens and body, but throughout the entire camera system. Based on the key concepts of high-speed and ease of use the EOS-series 35mm SLR cameras, including the top-of-the-line professional-model EOS-1 camera released in 1989 and the popular compact, lightweight EOS Rebel introduced in 1990, continued to incorporate innovative technologies and gained acceptance from a wide range of users. As digital SLR cameras gained increasing popularity starting in 2000, Canon developed advanced technologies such as its proprietary CMOS sensors and high-performance DIGIC digital image processors, as well as an extensive lineup of EF lenses, in an effort to fulfill the company’s key concepts of high-speed, ease of use, and high image quality. Currently, Canon offers a broad product lineup that helps serve the needs of users of all skill levels. Among the new Canon cameras that contributed to the realization of the 70-million-unit production milestone are the EOS 70D, featuring innovative Dual Pixel CMOS AF technology, and the EOS Rebel SL1, the world’s smallest and lightest digital SLR camera*, which combines a ground-breaking compact, lightweight body design with advanced basic performance. 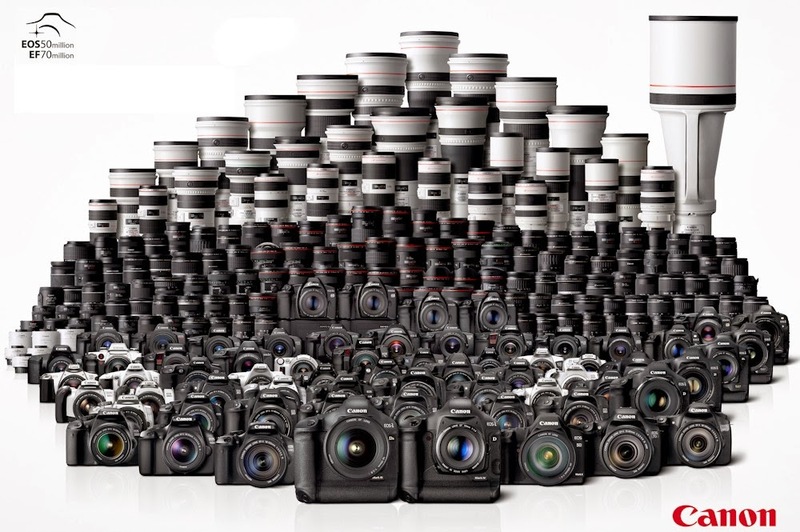 EF lenses for Canon EOS-series interchangeable-lens cameras are also on track to realize a major milestone as cumulative production is scheduled to pass the 100-million-unit mark in 2014. Based on its core optical technologies, Canon will continue to refine its diverse imaging technologies while striving to produce superb and reliable lenses and cameras that cater to the varying needs of photographers – from first time users to advanced amateurs and professionals – while contributing to expanding the culture of photographic and video imaging.